These work great. Use them all the time. 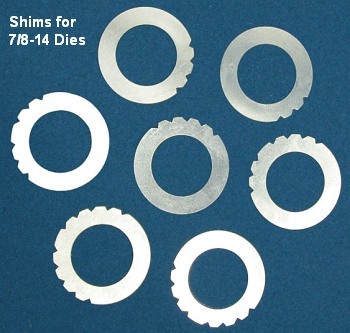 Why not purchase just a regular shim set at any hardware store and use the correct size between the die and the shell holder. That’s what I would do. EDITOR: Mark — The issue is that the “correct” size may change depending on the condition of the brass, the gun the ammo will be shot in, and even the press being used for full-length sizing (some presses have more slop and accordingly require the die to be lowered to get the same headspacing and bump as the same die set up on a stiffer press.) The Sinclair set allows for these variables as when you’re loading .223 rem for both a bolt gun and an AR15. I’ve been using them since Skip (Otto, of BR fame) came out with them. I set up my dies with the .006″ shim, giving me the option of bumping the shoulder a bit more when the brass gets old and hardens while still having room to adjust up for zero headspace, should I have missed the original setup by a thou or two. Hunting rounds can easily be bumped an extra .002-.003″ for positive, no-crush feeding. Being a safety oriented cheapskate, I couldn’t live without them – they let me reload my cases a gazillion times without dangerous web stretching. A must-have, as simple as that. They work extremely well when you use one sizing die for multiple chambers. I have a 6 dasher and a 22 dasher with their own shims and bushings. I have three 22 BR again with their own shims. Makes set up a breeze and easy to adjust as needed. Another great product. I have my die lock ring(s) adjusted for the shortest headspace length on my multiple chambers 6BR’s and 6ppc’s. When needing a longer headspace, just refer to my notes and add the appropriate shim under the lock ring. Keep it simple. Also excellent with a Giraud trimmer. Enables fine trim length adjustment without changing the lock ring. Handy with the seating die as well as the throat grows. Changing shell holders is far easier than removing the die to change shims. Reading offers a full set of shell holders from -.010 to -.002. I use this all the time! I tap my brass with a hammer until I can fit the shim in between the die and the brass. This is how you use it, right?